Recently, I transitioned my closet from summer clothing to fall and winter clothing. 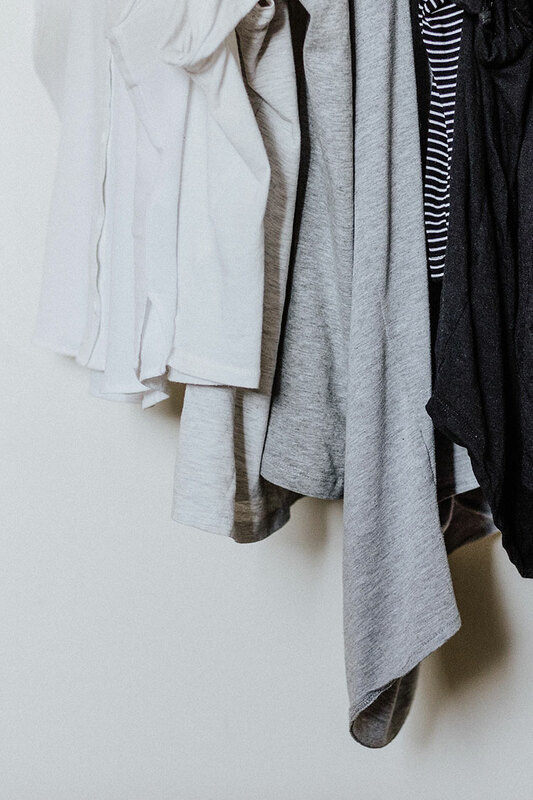 I documented the entire process on Instagram Stories a few weeks back, but basically I removed every single thing from the closet and re-evaluated whether it belonged or had to go! This system was really nice for a lot of reasons: I could see what I hadn’t touched all year and I could gather things for donation. Once I pulled my sweaters and winter clothing out of storage, it felt like I was actually shopping! Everything felt new again because I hadn’t seen it in so long. It was sort of like greeting old friends. Hello, favorite sweater! Nice to see you again, moto jacket! I really love to wear sweaters, so I even cleared out an entire shelf so I could fold them neatly there. Getting dressed now feels fun and easy because they are all there, laid out really nicely, just waiting for me to choose! While I was doing this closet overhaul, I identified a few gaps for essentials that I’ve had for over a year. For example, last year I realized that none of my boots were comfortable for my leg. They all either pressed on my hardware in a weird way or had heels that are too high. So I donated them and tried to fill the gap last year. I must have bought and returned 10 different pairs of boots! I ended up only buying a new pair of rainboots last year, but still don’t have a nice pair of black leather boots that I can wear out. I just ordered (and returned) 3 more pairs of boots, so the search continues. It is so frustrating! But I know that a good pair of stylish, but comfortable boots is out there… I just need to find them! The other gaps I identified were that I had to get new black leggings because my old ones had a hole in the knee and I needed a few more bras and workout clothing because my size changed. Then lastly, I indulged in a new sweater! many pairs of boots that have since been returned… again! So overall, it feels like I am way more on track with this no shopping challenge than my last check in. I definitely consider purchases wayyy more now than I did before. I have also noticed that this means I’m shopping locally instead of online. I mean, I have done my fair share of online shopping (especially for boots…), but I feel like I am more cognizant of what I can find at local boutiques that are within walking distance of my house. I’ve also been thrifting wayyy more, too. Ever since my collab with Value Village, it feels like I’ve almost rediscovered thrifting. The thrill of the hunt has definitely gotten me addicted to vintage shopping all over again! If you’re doing a similar challenge, I’d love to hear how it’s going for you and what you’ve learned along the way!